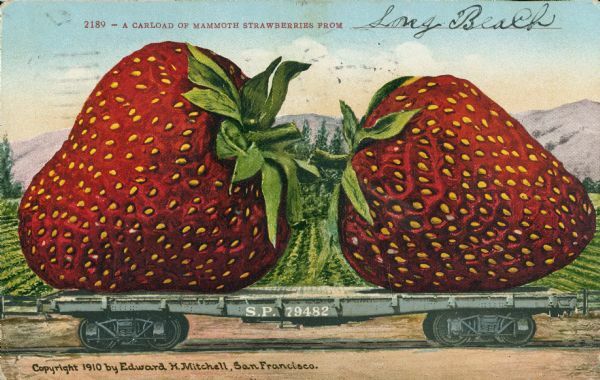 Photomontage of two giant strawberries on a flatbed railroad car. Fields and mountains fill the background. Red text in the upper portion of the image reads, "2189 - A Carload of Mammoth Strawberries From ______." The S.P. marking on the side of the car shows that it is on the Southern Pacific Railroad line. The purchaser of this postcard added the words "Long Beach" to the blank field on the front, referring to Long Beach, CA.